The DUO is the first bi-powered watermaker system world-wide. It functions at the turn of a switch on D.C. (12 or 24V) and on A.C. (120, 230), as the DUO is an intelligent patented system. Thanks to this system, the motors operate independently from each other, with neither electric clutch activation nor manual manipulation of the pulleys. Like all Dessalator products the DUO is 100% reliable and safe. For more than 10 years the DUO 60 and DUO 100 are mounted in batches by the large shipyards and are the choice for navigators. The advantage of the DUO is its "2 in 1" aspect, as if there were two water makers available with the facility to function optimally and logically. Façade D 60For example: When there is no wind and the engine is running, D.C. power (at 12 or 24V) is available and should be used (DUO 60: 370W, DUO 100: 600W). 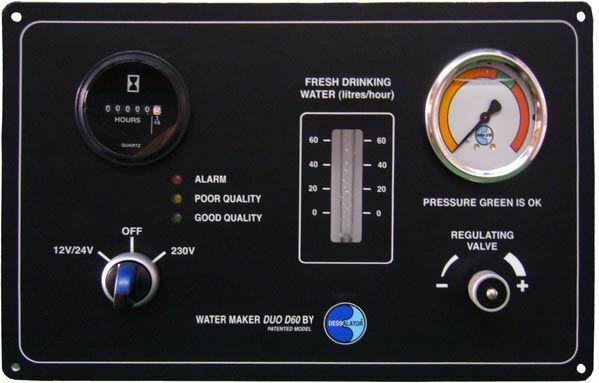 At anchor, when the power generator is running the watermaker can be operated on the A.C. supply (230V).